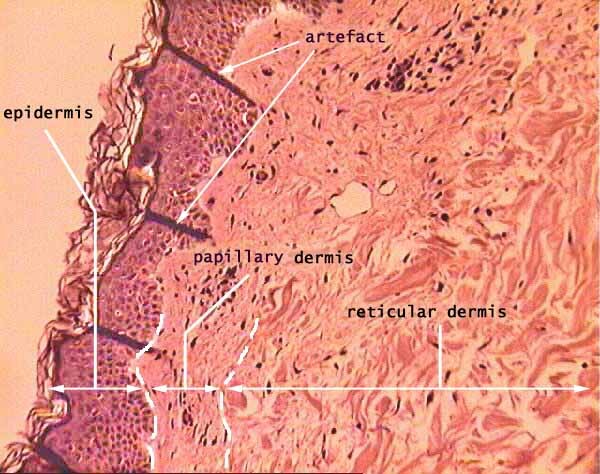 This image emphasizes the fibrous connective tissue that comprises the dermis. Although the difference between the finely-textured collagen of the papillary layer and the coarser collagen fibers of the reticular layer can be fairly distinct, as shown here, the boundary between these two dermal "layers" is fairly arbitrary. Overlying the dermis is the stratified squamous epithelium of the epidermis, consisting primarily of keratinocytes. The dark bars across the epidermis that are labelled "artefact" on the image above are wrinkles in the section.